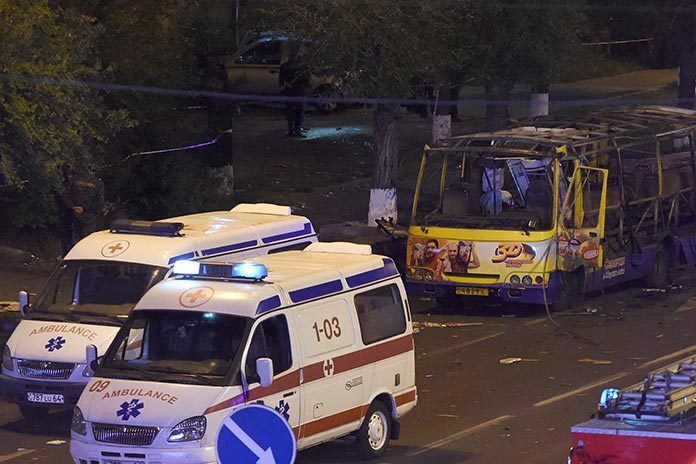 The Ministry of Health reports that the condition of all people who were taken to Armenia Medical Center as a result of a blast on a bus in capital Yereavn late on Monday is stable. According to the Ministry of Emergency Situations, the explosion on bus N63 occurred at about 10 p.m. on Halabyan Street, which is in Yerevan’s southwestern Ajapnyak district. It is reported that two passengers were killed and seven others were wounded in the incident. The two out of the latter are in critical condition, and the five are in serious condition. Edgar Gasparyan (born in 2002) and Roland Khojayan (born in 2001), two of the passengers injured in the blast, were taken to the “Sourb Astvatsamayr (St. Mary)” Medical Centre from the Armenia Medical Center in ambulances. According to Armen Muradyan, the Minister of Health, after night surgeries, the condition of the two teenagers has stabilized. As a result of complex surgeries, doctors were able to keep a limb of one of the teenagers. According to the medical staff, the young people should later undergo rehabilitation and plastic surgeries. According to the Ministry of Health, the passengers suffered bruises and got debris. One of the victims is a 37-year-old pregnant woman, who has not got any life-threatening injuries and yet her unborn child is safe. The woman is still under control of doctors.